In fact, I think this tree has already paid for itself twice over! As I got it in July 2009. I got this Ficus microcarpa 'Tigerbark' in July 2009, when the Fort Wayne club had a workshop with Jerry Meislik (known to many as "Mr Ficus" for his knowledge of the genus.) The 'Tigerbark' cultivar is popular with tropical-bonsai enthusiasts in the USA. 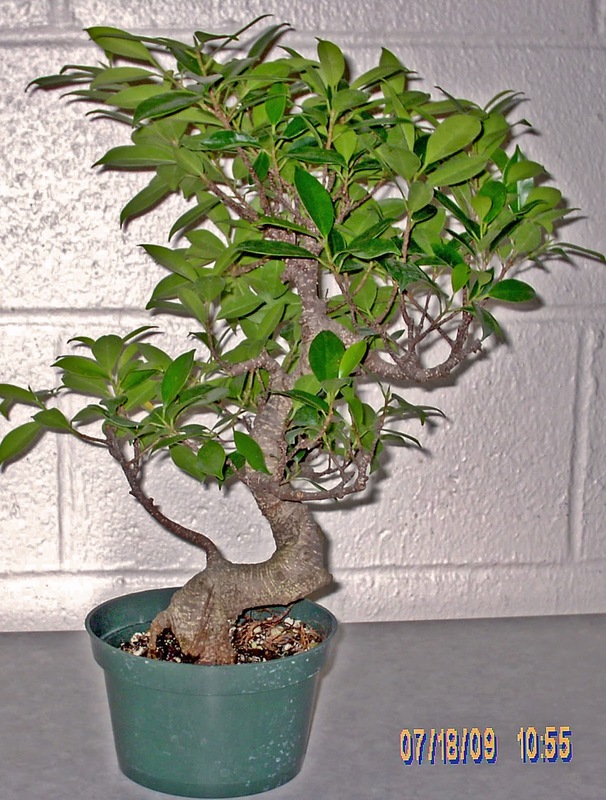 Besides the bark that gives it its name, it's known for its vigorous growth, aerial roots, and overall toughness. 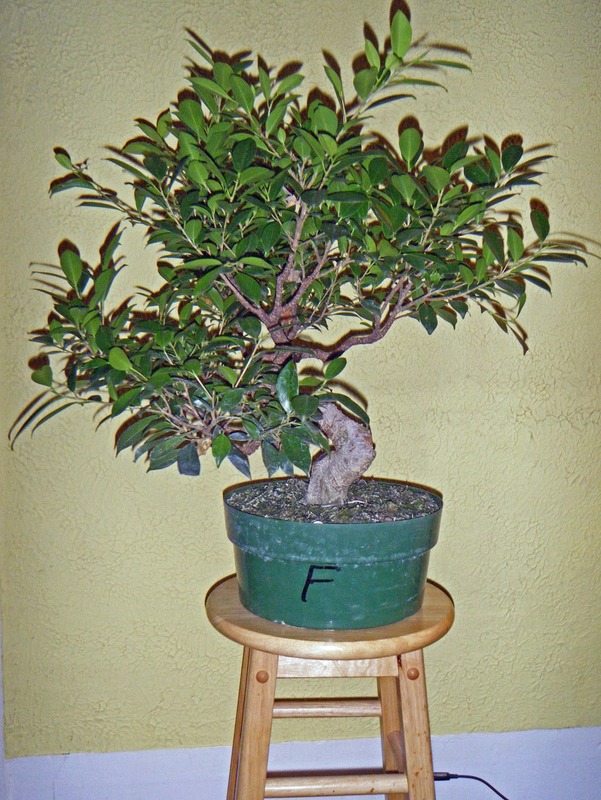 You can see in the picture the "S" of the trunk; a feature common to many trees produced for bonsai commercially. A lot of thought and work, over the last three years, has gone into developing a design that would eliminate the artificial look of the "S." That has involved a lot of pruning; not just of branches, but also of some chunks of trunk. And that has meant lots of cuttings -- in addition to the cuttings resulting from periodic trims! 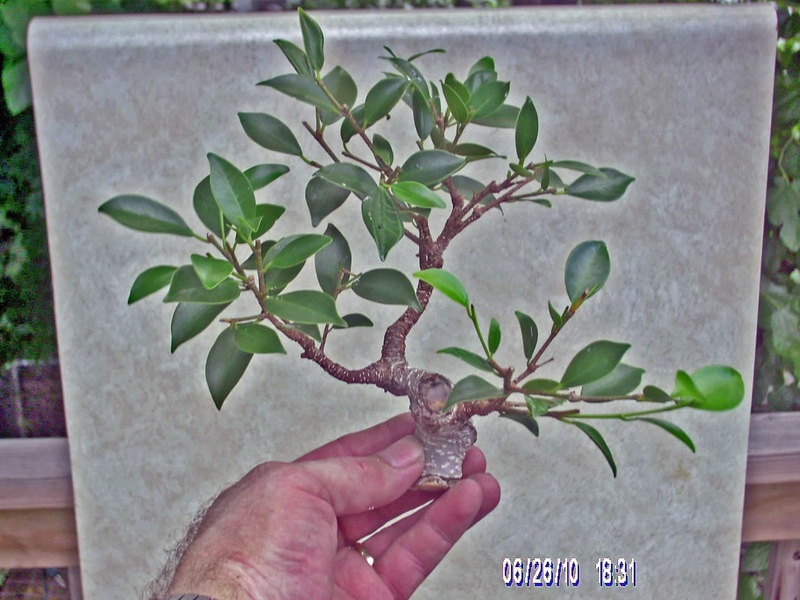 I'm the sort, as I've admitted before, that hates to throw cuttings away, and Ficus microcarpa cuttings root easily. The result has been literally dozens of daughter plants, most of which I've sold at club shows and our annual picnics. I've never charged much for them, but there have been enough in three and a half years to pay for the mother tree at least twice over, and probably more. One daughter tree I'm keeping. 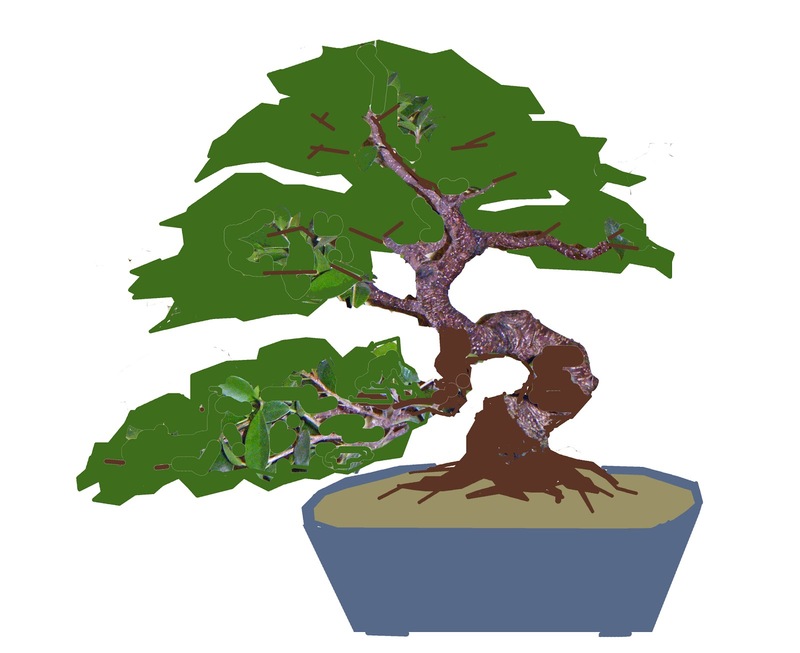 Two and a half years ago, in my ongoing attempts to refine this tree (and encouraged by other denizens of Bonsai Vault forum,) I removed what was then its apex. The lopped-off top, just removed. It rooted successfully in some coarse mix, and I've been growing it on since. About two weeks ago, I cut it back by half before moving it into the Crate for the winter. (Partly so it would fit under the lights!) Two days ago, I took a new picture. It's already putting out new growth. This will probably be my styling-demonstration tree at next summer's community fair. 10-inch-diam. pot. 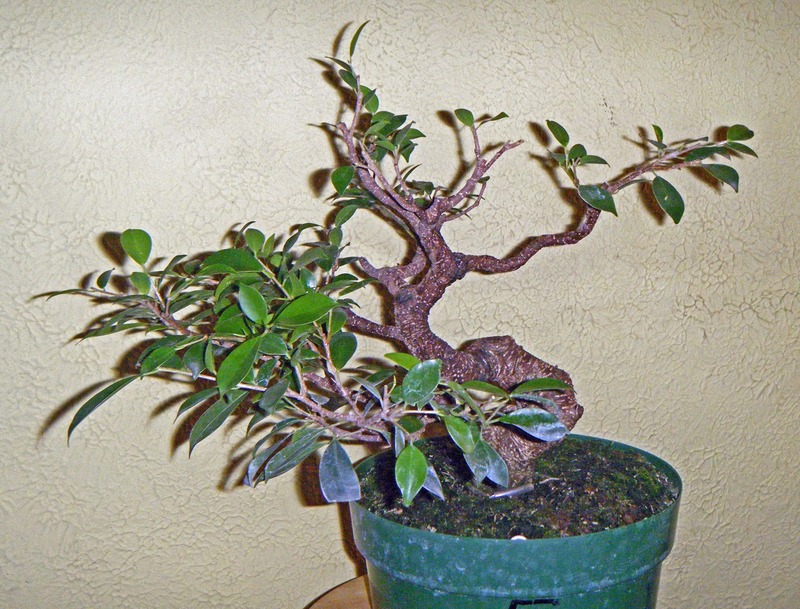 The original tree has been waiting in the mudroom until I could make time to prune it properly. That happened a couple of days ago and then it too went into the Crate. Here are before-and-after pictures. "F" marks the intended front. 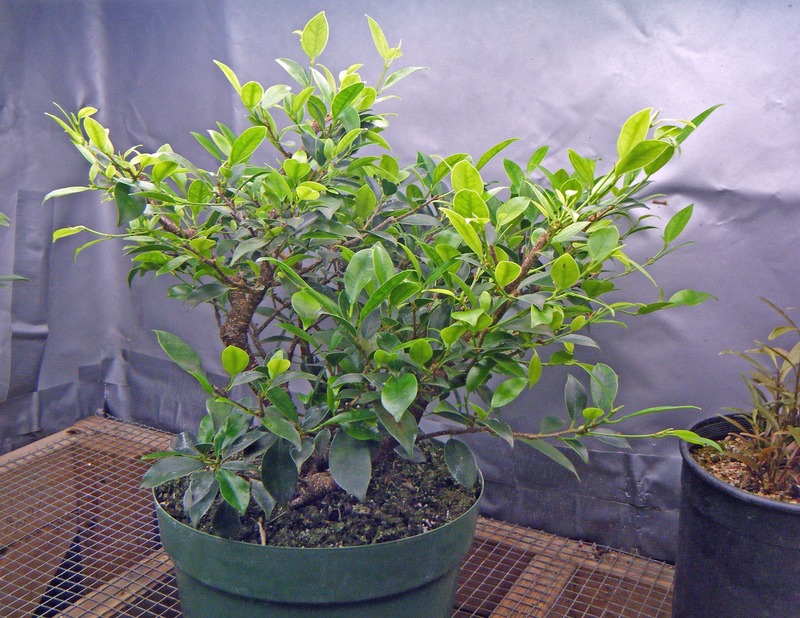 It will need at least one more pruning, equally drastic, before spring. And, yes; I kept half-a-dozen of the best cuttings for the next crop! This quick virt gives a rough image of the design toward which I'm working. Some details will undoubtedly be different by the time I'm finished, but this gives you the idea. The cascading branch (lower left) is intended to be a feature. For more about the Bonsai Crate, click here. To check out Jerry Meislik's website (and it's worth checking out,) please click here. After the "Riot in White"